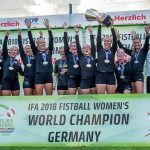 Three weeks before the start of the biggest Fistball Women’s World Championship in history, the International Fistball Association has published today the final schedule. A setback had the organizers in the number of participating nations as unfortunately, with the USA, Australia and Chile, three nations had to withdraw their participation because of financial or organizational reasons. “It is a pity that these three nations are now surprisingly not going to participate in the World Cup. Unfortunately, all nations announced their decision at very short notice, which has given us new organizational tasks, “says IFA President Karl Weiss. “Nevertheless, we celebrate the biggest World Championship in Women’s Fistball. We are looking forward to the start of the World Championship. Especially pleasing is the large transmission of live games on TV e.g. ORF Sport + or in the livestream at Laola1 or Fistball.tv, “continues Weiss. The IFA 2018 Fistball Women´s World Championship in Linz will start on Tuesday, 24th July at 1pm in the ÖBV-Arena. Group A is a group of 5 with Brazil, Switzerland, Austria, New Zealand and Belgium. In Group B, the six nations play Germany, Argentina, Poland, Serbia, Italy and the Czech Republic. Each of the top three teams in the group goes straight into the Double Elimination mode, while the fourth and fifth ranked play a qualifying round for the Double Elimination phase. The two semi-finals on Friday, as well as the match for bronze and the gold medal match on Saturday will be broadcast live on ORF Sport +. The final will be kicked off on Saturday, July 28th at 6pm.